How many times do I look at my phone? 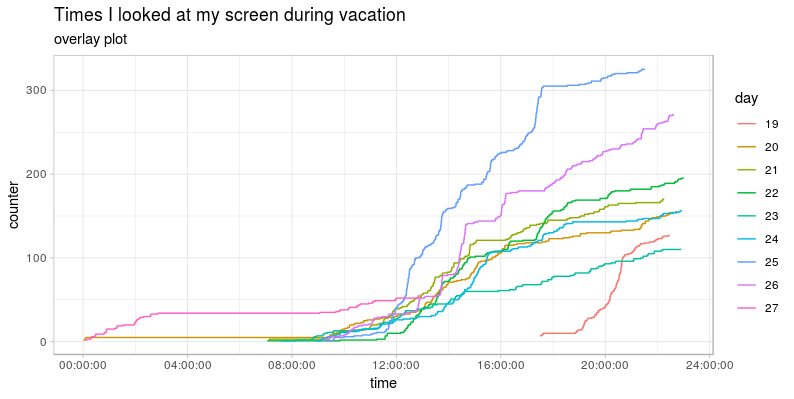 I set up a small program on my phone to count the screen activations and logged to a file. In this post I show what went wrong and how to plot the results. 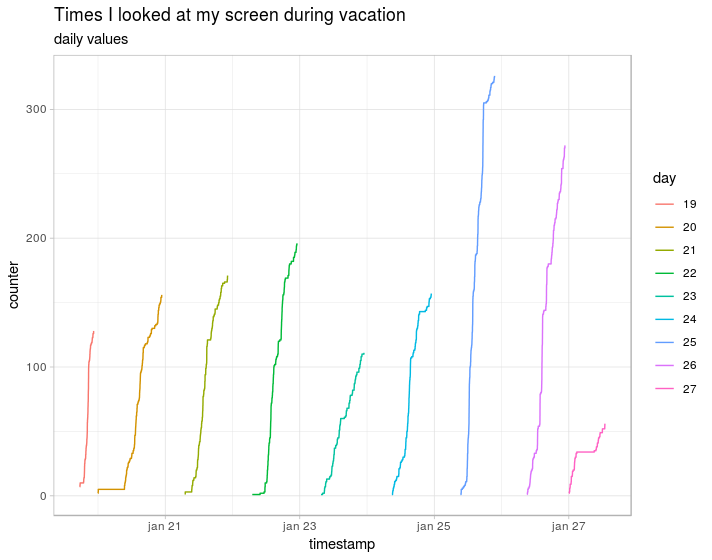 I set up a small program on my phone that counts every day how many times I use my phone (to be specific, it counts the times the screen has been activated). To account for comma use and possible problems I set up the program on my phone to write a “;”-seperated file that records screen_log, the date, the time and the current value of screen_count. Every day around 12 o clock it reset the counter to 0. I thought it would be cool to compare different days. I started the data collection on januari 19th around 17:00h, so the first day is already halfway through. For reasons I cannot fathom, sometimes the system date is recorded in the USA style MONTH-DAY-YEAR and sometimes in the rest-of-the-world style of DAY-MONTH-YEAR. I wish I could set it to YEAR-MONTH-DAY (ISO 8601). I use read_csv2, which expects “;” as a seperator and never converts text to factor. This particular textfile has no headers, so I tell R what to call the columns. I have to deal with the different time formats, so I set up a regex that works only with Januari, if it detects -01-19 it pulls out the numbers before that, if it detects the other variant it takes the second part. I combine the date and time into a timestamp and pull out the hours and minutes, before combining the hours and minutes into HMS time class. Finally I remove anything over 23 hours, because in that period the counter is reset. The only remaining question is: what did I do on the 25th that I looked soooo (326 times) many times on my screen? Is there a bug in the counting? Was I really bored, did I take a lot of photo’s? I was in the Botanical Gardens of Malaga and did take a lot of pictures with my phone.